The coloration results of these Pipes are displayed with more orange and red hues in a more consistent and even finish. These Pipes are not particularly outstanding in regards to artistic achievement, but do bring high sales bidding, because they are ‘colored.’ So many Meerschaum smokers are in a hurry to have colored Pipes that the market has responded in providing them as Estate Pipes, which has been a windfall for Sellers. The money is good enough to attract some creative thinking from Sellers. People will go to great lengths to color Pipes quickly or to expense to obtain them. 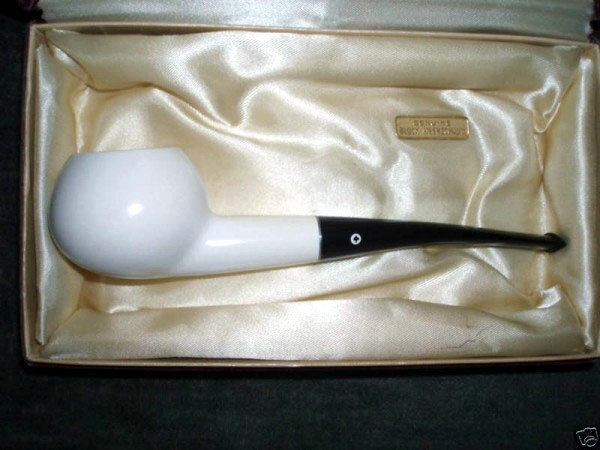 Brand name Pipes and Carvers, such as Andreas Bauer, Paul Fischer, CAO, Ismet Bekler, Golden Horn, Kaywoodie, Pioneer, GBD, Comoy, and Meerschaum Pipes made for shops to market under their own trade names, like RIECO for Iwan Ries & Co. or C.B. Perkins, which was later bought out by DES Tobacco Corporation, all offer attraction to the Estate Buyer. The range in quality of these Pipes is huge, from Pressed Meerschaum to African Block to high grade Turkish Block. African Block offers attraction to the collectors of Peterson, Kiko, Laxey and Isle of Man, especially since the mines shut down in 2006. The ones that interest me most often are Andreas Bauer and Paul Fischer, which were carved from high grade Turkish Block, so that is my focus in this discussion of the basics of the hunt. Identifying these old Pipes can be difficult and it isn’t unusual to find Pipes of questionable origin in the cases of sought after brands and Artisans. Deniz Ural, who has been in the Meerschaum trades some 42 years, tells me that he believes their foundation was in 1904 and they were the original company till 1970, when Turkish law banned the export of raw Sepiolite. Then a German lady bought out the company and soon after Otto Kopp bought the trademark. 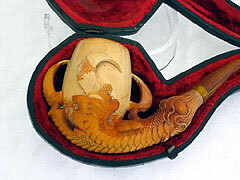 Otto Kopp was the # 1 customer of Koncak meerschaums (Ekrem Bey, Sedat’s father). They were a large Meerschaum distributor to the German tobacconists along with their own briars. In 1990 Sedat Koncak and her sister, who were taking over the business from their aging father, decided to buy the Andreas Bauer trademark from Otto Kopp. Sedat made some fantastic pipes in the beginning but could not pursue this project as it was born lame, with too high a price for the trademark and not enough production. The trademark became a commodity, which has been in reportedly 3 different ownerships to date, the last of which was an unfulfilled contract with the Koncak business. 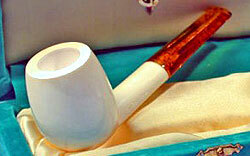 The original Andreas Bauer Pipes were of legendary quality, using both high grade Turkish Block and Amber. The Figurals are of such high artistic merit, that they became the industry standard, unequaled in achievement save for arguably Sadik Yanik’s best art. 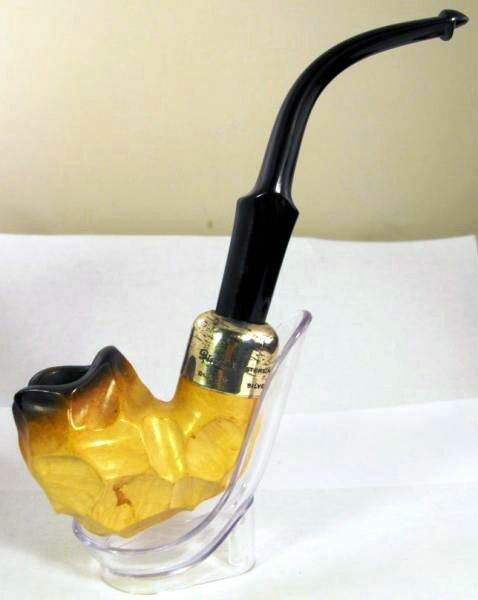 When they infrequently come into the marketplace, even the plain Pipes will have an Amber bit, a bone screw joint and the Block will display the translucent quality that only the best Block shows. 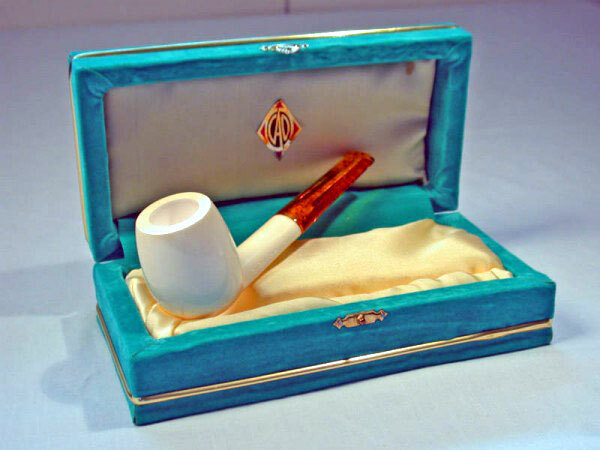 The Andreas Bauer Pipes from the Koncaks will be either smooth finish or lattice and have a derlin push/pull connector and a hand cut bit The cases may or may not claim to be from Vienna. These are good Pipes, but are not valued as much as the original Pipes from Vienna. This trademark is the most common fraud encountered in the marketplace and even now some are showing up that are of more recent construction that claim to be authentic. 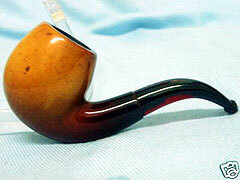 Your best recourse in evaluating one of these Pipes for possible purchase is dialogue with the Seller. Lacking this, I would suggest not pursuing the purchase. Pipes by Paul Fischer also attract me. Little information survives about this Artisan Meerschaum Pipe maker. A German immigrant family owned business of 4 decades that settled in Orchard Park, NY, from the late 1950’s until the early 1970’s when the shop closed. It was called the House of Fischer. 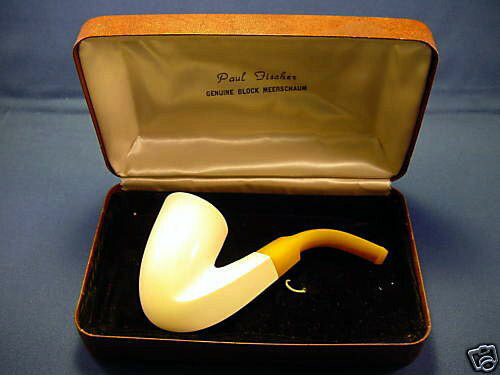 Paul is often credited with being the premier artisan of the new age of Meerschaum shapes that combined his flair and traditional forms. When the shop closed, he continued carving in his studio shop until the mid 1970’s. 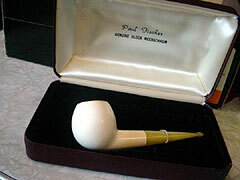 There are many Pipes that show up in Paul Fischer Pipe cases that are of questionable origin. Paul’s style is recognizable by those who have seen his work. His bits are hand cut from the old Amberoid plastic, with the more recent ones being hand cut Lucite – likely among his last works. The bit –to-shank connectors will always be a bone screw and will not be of recent production. 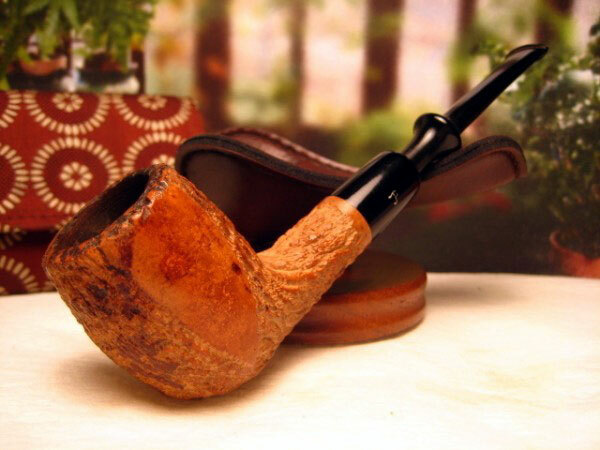 Again, when considering acquiring one of these Pipes in the marketplace, if you cannot establish meaningful dialogue with the Seller, then it is best to not bid. Once you’ve determined that a Pipe in auction is one you believe is authentic, then you should consider the cost of any repairs that might have to be made, if the Pipe is to be smoked. Hopefully, you’ve been able to make this evaluation prior to the purchase, but sometimes this is not the case. Some Sellers are sincere in their attempts to provide information, but lack the knowledge required. 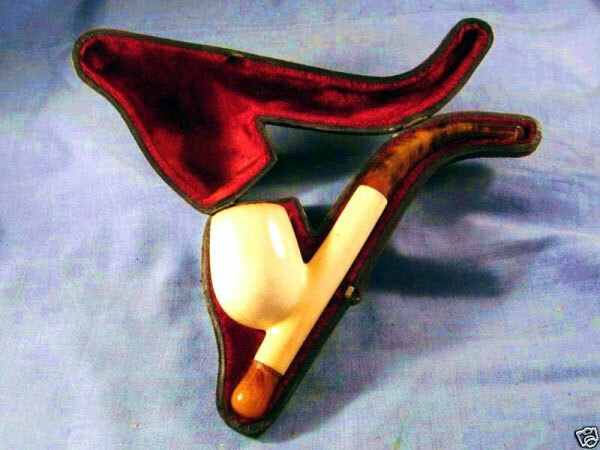 It is good to have already discovered the nature of the Seller’s character during the sales process, but sometimes you really don’t know what will be required until you have the Pipe in hand. Over time, I’ve learned that cleaning up Estate Meerschaums can be a lesson in delayed gratification. I used to rush into removing surface blemishes with Everclear and wet/dry sandpaper, which works well and requires re-waxing. The drawbacks to this are the adverse results it can have on the Patina, which is the most time consuming aspect of bringing these Pipes back onto their path of evolution. My approach to this is less aggressive than my past efforts, as I’m doing the best I can not to disturb the Patina. Initially, start work on these blemishes with a white cotton rag with Everclear on it, just enough to remove the surface grime, but not enough to draw the entire blemish out of the Block. Before smoking it for the first time, I cold wax the entire Pipe, paying particular attention to the blemishes, As I smoke the Pipe, I rub Beeswax on it, with attention to these spots. 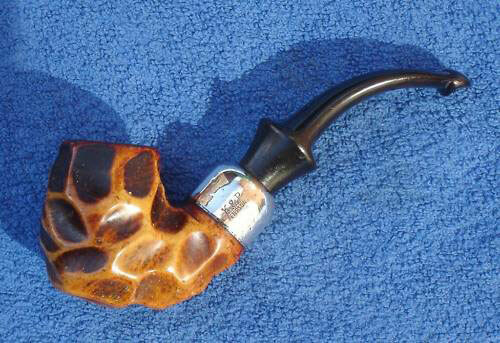 After a half dozen smokes, the Pipe will start to show more of the coloration and these blemishes will become diffuse, so that they are less defined. This technique seems to be better in the long run, as the Patina continues to develop more than if I’d used sandpaper. This method of waxing also works well with keeping the bowl plateau of a new Pipe from getting scorched, as the Beeswax works to spread the smoke marks as well as aid coloration and provide protection for the Block. 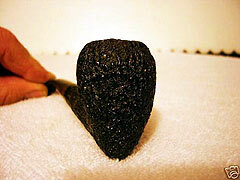 Cleaning of the Estate Pipe should always include removing the cake, down to the Block. The use of Everclear, a shank brush and plenty of Pipe cleaners is required before the first smoke and after every smoke, as the Pipe flushes itself of the ghosts of previous use. Routine cleaning after every smoke will result in a clarity of the smoking experience unequaled by other materials used for Pipe construction. 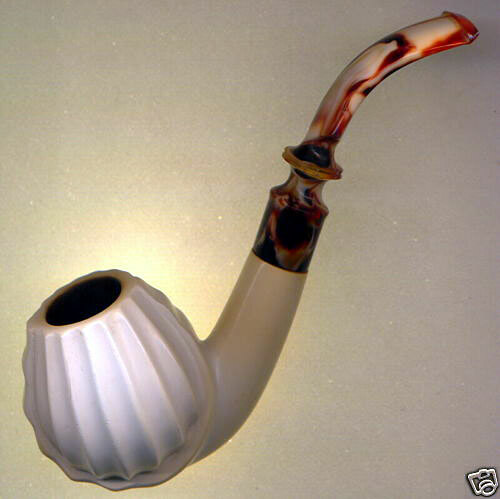 The use of Beeswax on Meerschaum Pipes is the most popular subject of both the maintenance of new Pipes and the restoration of the older ones. My preference is to rub refined white Beeswax on the Pipe as it is being smoked, allowing the heat of the Pipe to both melt the wax and facilitate how much of it the Block is going to absorb. Excess can be easily removed with a clean white cotton rag, preferably before the Pipe cools. Another method is to daub melted Beeswax onto the Pipe and melt the excess of with either a heat gun or hairdryer. This requires removal of all plastic parts of the Pipe, as the heat will melt them. It also makes a mess, as the hot wax gets blown off the Pipe. It’s very important to make sure that the Block is dry, as any moisture in the Block while the heat is being applied runs the risk of cracking the Block. The same precautions apply to putting the Block in a vat of melted Beeswax, after both the shank and the bowl have been blocked with cork. If you do this, remember that the Beeswax is flammable and should never be heated enough to make it boil. These techniques require that the Pipe is buffed with a clean white cotton cloth, to remove the excess. It’s also a good idea to remember that while the Block is absorbing the Beeswax, it will also absorb anything that is on your hands, so avoid touching it while it is hot. These methods work best with smooth surfaced Pipes. Lattice Pipes can be a little tricky, so avoid getting a lot of wax in the lattice holes, or you’ll have to dig it out later. With intricate carvings, I suggest using Halcyon II, as the required buffing could be a big problem if Beeswax is applied to these delicate carvings. Halcyon II requires no buffing, but it doesn’t provide the hard protective finish of Beeswax, nor does it aid in the development of coloration. The restoration of patina in an Estate Pipe is the most time consuming process involved in this work. 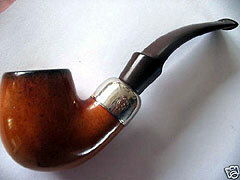 It is better to go slow with a cautious approach than to wind up starting from the beginning of the Pipe’s evolution. 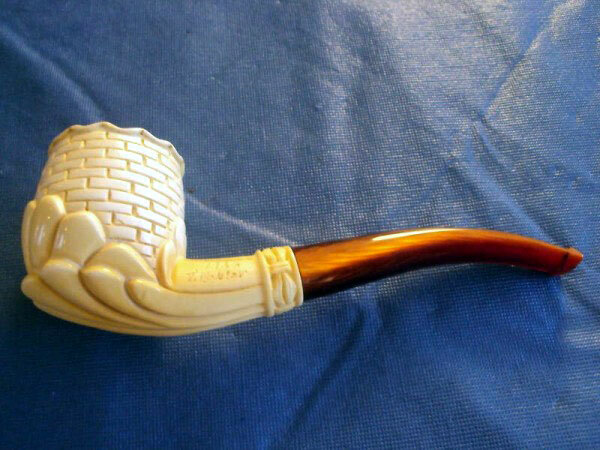 Not all Buyers in the Estate Meerschaum market are after specific brand names or Carver specific Pipes, and opportunity exists for value purchases in both the Turkish Block and African Block Pipes available. 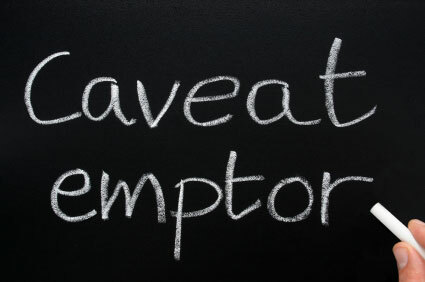 There are issues that need to be considered before any commitment to bid or purchase is made. Is the Pipe in good shape or will it require repair? Are there any cracks, chips or parts of the Block missing? What is the nature and condition of the bit-to-shank connector and does the bit align properly, without wobble? The status of the bit is important as well. Does it have any tooth marks, cracks or has it been repaired. Amber bits are frequently seen that have been repaired and/or shortened. The cost of repairs can quickly make the final price of the Pipe increase substantially. Amber is fragile and expensive to repair. Previous repairs to the Block should be evaluated for both artistic merit and quality of craftsmanship, as both of these factors directly impact the future service expectations of the potential Buyer. Cleaning up a Pipe is one thing, but the repairs required to bring it back in service are another important aspect of any purchase consideration. If you are looking at a Pipe in an estate sale, you have the benefit of being able to see it and evaluate it’s value firsthand. If you are dealing with a reseller on the internet, dialogue is absolutely necessary, especially if the Seller has a ‘No Returns’ policy. I have found the reward of smoking these old Pipes to be a pleasure. Once the Pipe is cleaned up and allowed to flush the ghosts of past fires, they smoke wonderfully and share the lessons they have learned from Fire and tobaccos. They can be wonderfully carved treasures of functional art or simply witnesses of past glory from years that have gone by. The potential gems are worth the occasional loss. 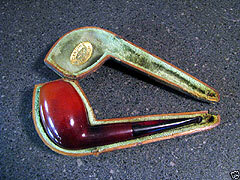 Every good Pipe should have more than one owner and these old sages have many years of service still in them. It is the thrill of the hunt and the pleasures of using these old masters of the Meerschaum Experience that keep me involved. These are the basics. Come and join in the fun! 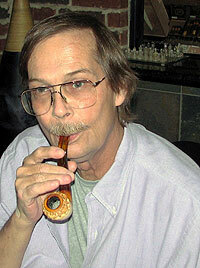 Fred Bass is the founder of the “All Things Meerschaum Group” on Smoker’s Forums. All but one of the pipes shown in this article are from his collection. You can see more of Fred’s Meerschaum Pipe Collection in his Pipe Photo Album, which includes close to 100 pipes. Excellent…thank you for a very good read !! Thank you for imparting your knowledge to us in this highly digestible read. 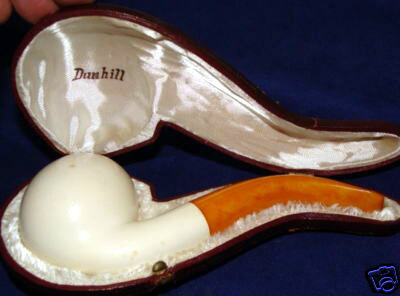 You are a wealth of information in all things Meerschaum. Can’t wait for the next article. Another great article on meerschaum pipes Fred! skills in taking a raw product to a great result. Wonderful piece, Fred. I just re-waxed three of my prized meers. I wish I had read your article first! A great article. I had thought that the meerschaum was strictly ornimental. I just learned something new. Thankyou very much. Their beautiful. thezman. Another great article fred. As always a lot of info presented. Very nice article Fred. I went over to the Up In Smoke by Northpark yesterday while my girlfriend was in the container store next door. I got to talking with the worker there and he asked if I posted on any forums. I said PM and he dropped your name saying he knew you and that you were a regular at the store and talked about how you just wrote an article for PM. It was a pleasant surprise. On a side note, very nice place with a large selection of both tinned and bulk tobacco. I picked up an ounce of the Pot Luck, though the guy didn’t know what the heck was thrown in lol. I’m Spanish and I don’t know what \everclean\ is, because I don’t find any translation for this word. Everclear is the brand name for 95% (190 proof) alcohol by volume grain alcohol.